Camcorders have become a must-have device whether it’s for a weekend of mountain-climbing two hours from home or seven days on warm beach halfway across the world. While enjoying the benefit from camcorders, you shall also keep in mind that such on-the-go devices often come with videos in MOD format, which makes video hard to playback on other mobiles. MOD is a file-based format that is stored on a random-access media. Standard definition video is stored in MPEG program stream container files with MOD extension; in most other systems these files have extension MPG or MPEG. MOD format is used on many digital camcorders, such as the JVC Everio, the Canon FS100 and the Panasonic D-Snap SD-card camcorders. Despite MOD video can be viewed on a computer with a player that is capable of reproducing MPEG-2 video, it is impossible to play back MOD video files through many portable media players because of the incompatibility. 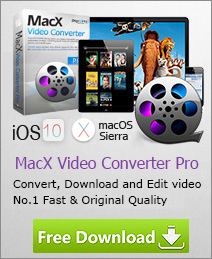 All you need is a superb Camcorder video converter for Mac and Windows. Free Transcode MOD Video to MP4 Now! Best free video conversion app for Mac users to free compress and convert MOD video to MP4 on Mac for playback on iPhone iPad Android, media player, 83X fast! Supposing you've got your Mac running iTunes, your iPhone, or maybe an iPad for good measure. What do they all have in common? The answer is they are not only all portals to the world of video enjoyment but also commonly save video in MP4 format, which delivers professional-quality audio and video streams over a wide range of bandwidths, from cell phone to broadband and beyond and has become one of the most popular video formats in the world. So if you want to import camcorder video to iMovie for editing on Mac or playback on iPhone, iPad, iPod, etc, you need to convert MOD to MP4 format on Mac first. To be frank, changing camcorder video to MP4 on Mac is dead-easy as long as you own MacX Video Converter Free. This program gives you the option to encode videos from more than enough input and output file formats and helps to convert camcorder video to MP4 video on Mac for free easily without complications while holding high quality and super fast speed. Below is the step by step guide on how to compress and convert MOD video to MP4 format on Mac. After free download this MOD to MP4 converter on Mac, click "Add File" button to browse your computer hard disc and add the MOD file. Batch conversion is also supported, you can load several MOD files at one time. 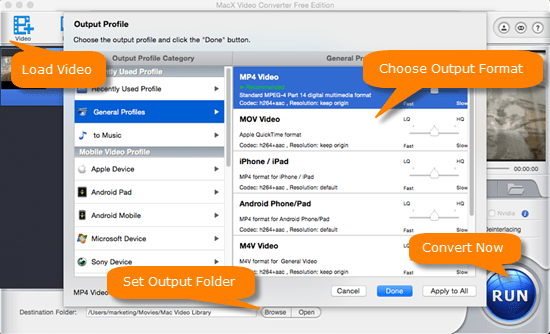 Since you want to convert MOD file to MP4 on Mac, here you can choose "to MP4" as output video format. You can also change audio and video parameters as you wish. In the mean time, this Camcorder MOD to MP4 converter for Mac gives you the choice to adjust the decoder/encoder parameters, such as video bitrate, video resolution, frame rate, increase or decrease video quality, change the output video aspect ratio, etc. After finish the above steps, click the "RUN" button to start transferring MOD to MP4 video on Mac OS. Note: besides converting MOD to MP4 on Mac, this utility also supports converting any video to MOV, YouTube, Music, etc. For those who want to free download online videos from YouTube, Facebook, Vimeo, Vevo, etc. and transcode video to more output formats, MacX Video Converter Pro will do you a favor. It works with a number of portable media devices, such as iPad, iPod, iPhone (iPhone Xs Max included), PSP, Samsung, HTC, etc and handles almost anything you throw at it.